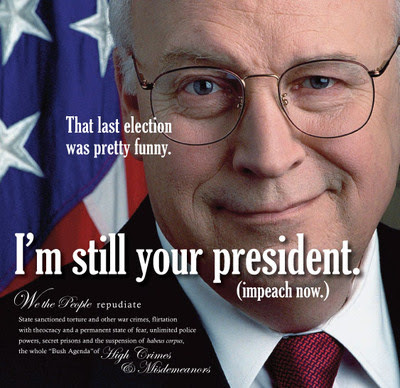 Cheney & Iran: Here We Go Again? The Justice Department must give more substantial reasons for not complying with the ACLU’s FOIA request for NSA spy program documents. In December 2005, the ACLU and the National Security Archive submitted requests under the Freedom of Information Act (FOIA) seeking records relating to the NSA’s warrantless wiretapping program. The ACLU and the Archive filed a lawsuit to enforce the FOIA requests and the case was consolidated with a similar lawsuit brought by the Electronic Privacy Information Center (EPIC). The government asked the court to permit it to keep the NSA documents secret. Congressional Democrats are trying to undermine U.S. Army Gen. David H. Petraeus’ credibility before he delivers a report on the Iraq war next week, saying the general is a mouthpiece for President Bush and his findings can’t be trusted. “The Bush report?” Senate Majority Whip Richard J. Durbin said when asked about the upcoming report from Gen. Petraeus, U.S. commander in Iraq. Rep. Chris Van Hollen of Maryland, chairman of the Democratic Congressional Campaign Committee, said Gen. Petraeus’ report was potentially compromised by the White House’s involvement in drafting it. “If the same people who were so wrong about this war from the start are writing substantial portions of this report, that raises credibility questions,” he said. THE entire French dossier into the death of Princess Diana has disappeared, it was revealed last night. Authorities in Paris are set to launch an investigation after the highly-sensitive 6,000-page report vanished in mysterious circumstances. The files contain every shred of evidence compiled over 18 months during a £6.4million inquiry. Its loss will fuel conspiracy theories that French investigators found information showing Diana’s death was more than an accident. Many believe the Princess was murdered by secret service assassins who forced her vehicle to crash. Harrods tycoon Mohamed Al Fayed, whose son Dodi was also killed in the crash, is convinced Diana was murdered in an Establishment plot. It is feared the disappearance of the dossier could prevent an official inquiry from ever establishing the truth about the Princess’ death. The Iraq War has been lost. The British are acknowledging this fact by pulling out their troops from Basra, Iraq’s second largest city, handing over the city to the control of Shia militias. For all intents and purposes, the “Coalition of the Willing” is now dead. America is now going it alone. Bush is not acknowledging defeat, but has indirectly admitted it by saying that some troops can start being brought home soon, even though clearly nothing has been accomplished with the addition of 30,000 troops for the last six months. He acknowledged defeat too, by flying into Iraq stealthily in the dead of night this week, landing at a remote desert outpost in western Iraq, instead of going to Baghdad, and meeting with American military officials, instead of with the Iraqi government. (So much for Iraq’s being a “sovereign nation”! Can you imaging a head of state of some foreign government, together with his war secretary and his secretary of state, flying in unannounced to some remote American state, and not even meeting with American government officials?) Clearly the US military could not guarantee the president’s safety in Baghdad and the Green Zone, so he had to go to a remote outpost where he was safe behind razor wire, mines and an obscene arsenal of soldiers, tanks and gunships. OK, throw another $50 billion down the rat hole that is the Iraq occupation. It’s only money, if you ignore the lives being destroyed. That’s what the White House is asking for, in addition to the $147 billion in supplementary funds already requested, and Congress will grant it after Gen. David Petraeus and Ambassador Ryan Crocker follow President Bush’s photo op in Iraq’s Anbar province with a dog and pony show of their own. Meanwhile, the Democrats are totally cynical about this continuing waste of taxpayer dollars and of American and Iraqi lives, and, wanting Bush to hang himself with his own rope, they will deny him nothing. Months before the Iraq invasion, President Bush apparently ignored a 2002 Oval Office briefing in which CIA director George Tenet provided the president with intelligence that Saddam Hussein did not possess weapons of mass destruction, according to former Clinton advisor and Salon columnist Sidney Blumenthal. Blumenthal also adds that the intelligence from that day was left out of the National Intelligence Estimate of October 2002, which definitively stated that had WMD.